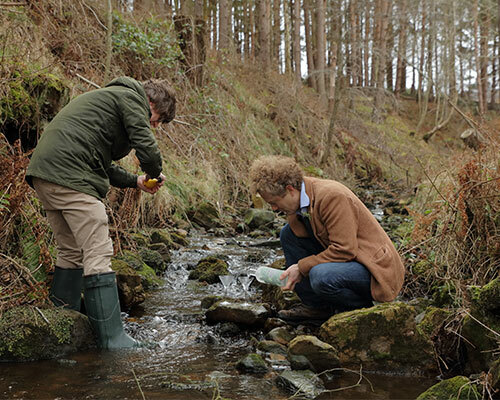 In the depths of the Northumberland National Park, two men are attempting to make gin martinis over a babbling, ice-cold stream. A small, shaggy black dog pants excitedly around their feet. “Do you think they look all right?” one of them asks, fighting to burn lemon peel with numb fingers. “Quickly, let’s get the shot so we can start drinking, it’s already past 10am.” The other chortles, plodding about and smiling to camera. It’s drizzly and it’s freezing, but it seems the guys at Hepple Gin are in high spirits and more than happy to get their hands dirty (or wet) to achieve the perfect shot of their beloved gin. The chaps in question are Walter Riddell and Chris Garden (the dog is Minot). 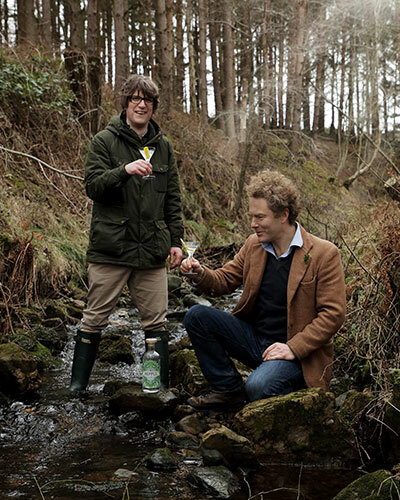 Two friends who united back in 2014 with a dream of creating the perfect gin. Walter, I discover, grew up right here in sleepy Hepple, Northumberland, where their gin-making takes place. Not that you’d believe it, though, when he opens his mouth. “Yeah, my ridiculously-posh accent tends to confuse people,” he smirks. Chris, meanwhile, hails from Scotland. Well-versed in all things gin, he has a degree in brewing and distilling and enjoyed a six-year career at award-winning London-based distillery, Sipsmith, before moving to his wife’s native Newcastle for a new start. He’s now head distiller at Hepple. The chums came together, in a rather serendipitous way. 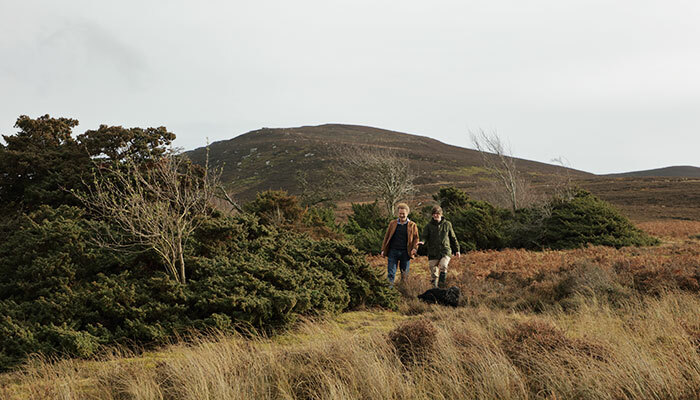 Inspired by a stroll among Hepple’s gnarly juniper bushes with his childhood mate, the food writer, broadcaster and one of the great foraging chefs, Valentine Warner, he and Walter began discussing the possibility of creating a gin infused with the moorland herbs that surrounded them, transporting the natural, untouched flavour of the wild to the bottle. 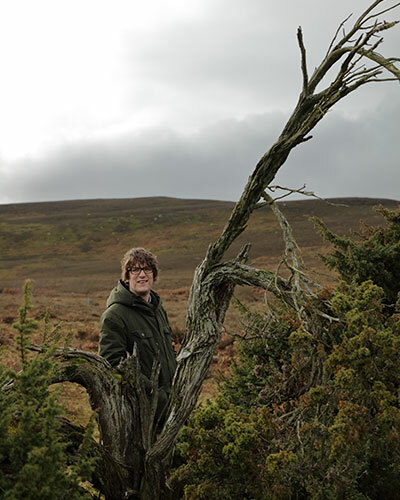 On a hunt to find a master gin-maker to help bring their vision to life, they soon crossed paths with Chris, an old pal of Valentine’s, and within weeks, Hepple Gin was born. “Val just so happened to be at a party at the Sipsmith distillery when he discovered I’d actually left the company and had moved up to Newcastle,” says Chris. Under their appropriately-named brand, Moorland Spirit, the trio have spent the last few years working tirelessly to develop and perfect their Hepple Gin, a fresher-than-fresh artisan spirit, made with six individually-distilled wild botanicals – five of which are hand-harvested from the Northumberland National Park. A thoughtful mix of fragrant Douglas fir, blackcurrant leaf, lovage, bog myrtle and the star of the show – juniper – give the gin its distinctive taste. A touch of Amalfi lemon peel, the only ingredient that the team import, makes for the finishing touch. “Juniper should always be at the heart of any gin, but we wanted to take things to the next level,” says Walter, who, along with his wife, Lucy, now lives just a few footsteps from the Hepple distillery – an old coach-house-turned-rural-laboratory. 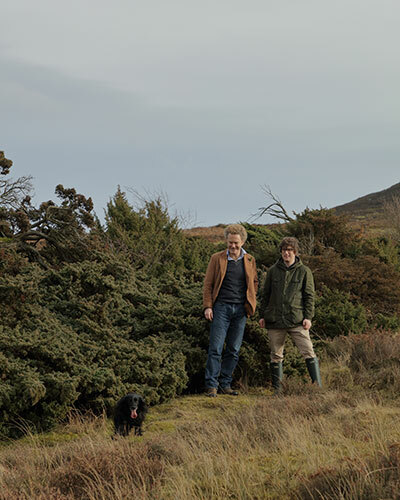 During our visit, I’m given a tour of the windswept, juniper-rich land that surrounds Hepple HQ; 4,000 acres of rugged moorland, ancient woodland and hilly farmland that stretches from the highest point of the Simonside range, four miles west of Rothbury. One of Britain’s last wild sanctuaries, untouched by modern farming and mass tourism, it’s a breathtaking, unspoilt spot that clears away the cobwebs and makes your cheeks pink. It’s the first time I’ve been out on the moors for quite some time and it takes all my strength not to be completely swept away by its beauty, pack up all my belongings and live a new, remote life here. The air is clean and crisp. There’s fresh spring water flowing and the sky is bright and clear. Things that are a normal part of everyday life here at Hepple Gin and yet, somehow, still manage to excite Chris and Walter as much as they excite me, a visitor. No wonder then that Moorland Spirit is one of the businesses showcasing Northumberland in the county council’s ambitious just-launched Discover our Land tourism campaign. “Isn’t it beautiful? How could you not fall in love with this place,” says Walter, eyes watering from the blustery cold. He’s carrying a heavy picnic basket of gin uphill to our location of choice, the cold winds biting at his chops, and yet he’s still grinning from ear to ear. “If you stop to really think about it,” he says, catching his breath. After an hour or so on the moors, muddling makeshift martinis (neat gin, in our case, made last week) and caressing juniper bushes, we head back to the distillery to get a taste of the live gin-making action. While Walter, a self-confessed ‘country hick’, comes to life on the land, it’s obvious this is Chris’ domain – a place in which he feels most at home. It’s smaller than I had imagined, but undeniably impressive. An experimental, Willy Wonka-like laboratory, if you will, where Chris’ scientific expertise flourishes. 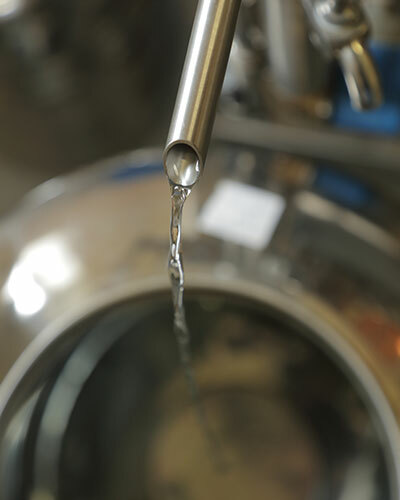 With the help of Cairby Hill, a good friend of the team, who has a background in biochemistry and microbiology, and a wealth of knowledge in distillation and flavouring methods, Chris created a specialist distilling process, using three pieces of equipment, to separate Hepple from any other gin on the market. The team describe it as their ‘triple technique’. 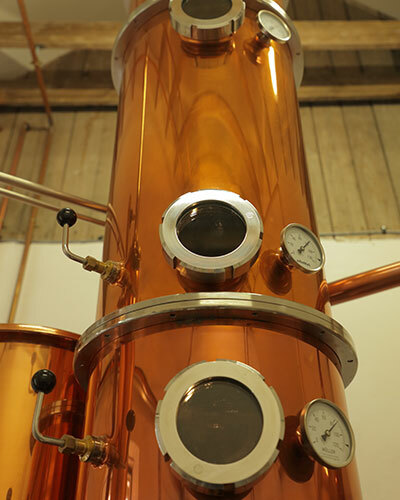 “We use a traditional copper pot to create our base gin – the bones that everything else hangs off,” explains Chris. “In there we muddle our Douglas fir, bog myrtle and juniper, to create a smooth, fresh heart. Chris points to the still; a giant glass ball, filled with greenery and berries, that spins and whirls. Quite mesmerising. But it’s the third and final step, I learn, that is the most crucial of them all. “Our supercritical extraction machine is where the real magic happens,” says Chris, moving us over to a smallish piece of machinery in a corner of the lab. “It doesn’t look like a lot, but it’s a piece of equipment that nobody else in the gin-making game has. 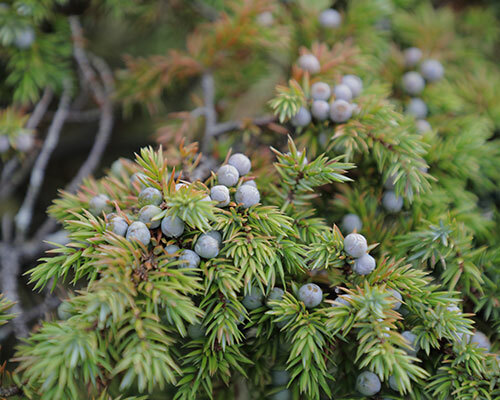 Originally intended for the perfume industry, it basically helps us extract every part of the juniper berry – the root, the needle, the bark and the berry itself – giving us a totally unique, well-rounded, three-dimensional flavour, in liquid form, that normal distillation wouldn’t. “You get the whole expression of juniper through this machine,” says Chris, patting it fondly. And it is a very good gin. So too is the sloe and hawthorn gin – their latest small batch offering, created by Valentine. A smooth, sweet and spicy take on conventional sloe that the team batch up in the winter. Delicious. And then there’s their latest addition, their Douglas fir vodka – the first launch in a new range of limited edition spirits. An experiment that turned out very well indeed. “It’s not a vodka that’s designed to be thrown together with a can of Diet Coke,” says Walter. “It’s more like a unique botanical spirit – a sophisticated one, designed to stand strong and true over tonic and ice. “We’ve long-loved the flavour that the needles of our Douglas fir trees give – like the cold breath from the forest – so one day we decided to put them through our three-step system to see what would happen,” says Chris. After some serious taste-testing behind distillery doors, talk turns to the future. Do they plan on making any more spirits? Are there any more awards they’d like to win? Do they plan on expanding? “Of course we want the business to thrive, but for us, it’s honestly not a capitalist thing – it’s not about making money. It’s about the quality of the products. That matters more to us than anything else,” says Chris. “As you’d expect with such a close-knit team, there’s a huge sense of emotion behind it,” says Walter. 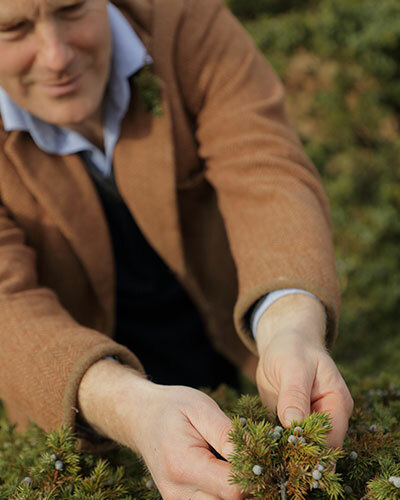 To expand their understanding of their beloved juniper and to further care of their cherished land, Walter plans on continuing the work he does as part of his ambitious restoration and propagation programme – The Juniper Project. It sees the team re-plant around 200 juniper seedlings each year on some of Northumberland National Park’s most highly-protected land. “It’s an on-going side project for me, but one that’s hugely close to my heart,” he says. As for awards, winning them isn’t something the team really think about, but they’re incredibly grateful for the ones they’ve bagged over the last few years. “Winning double gold at the 2017 San Francisco World Spirits Competition was a real personal highlight for me – I had been dreaming of that for like nine years,” says Chris, with a smile. 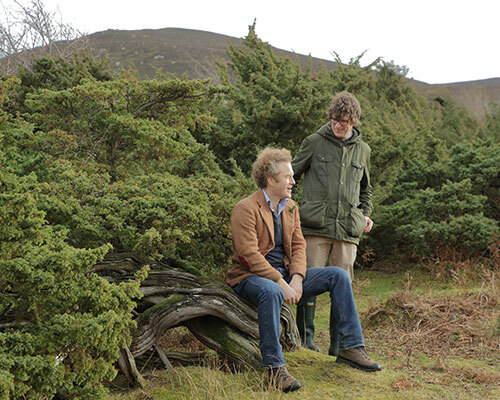 Thoughts of creating new products aren’t too far away from Walter and Chris’ minds, though they’re quite adamant that Moorland Spirit will not be churning out bottle after bottle for the sake of it. 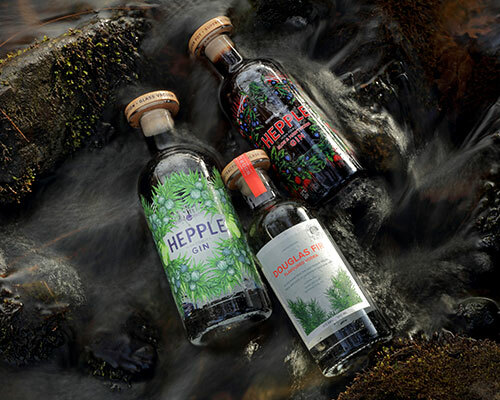 To give as many gin-lovers as possible a taste of Hepple, Walter, Chris and Valentine work closely with their mutual friend and cocktail artist, Nick Strangeway, and their suppliers – big names like Fortnum & Mason, Fenwick, 21 Newcastle, House of Tides, Cook House and The Patricia. It’s an area both guys are very passionate about. “Nick is recognised as having one of the most revered palates in the business – he’s at the very top of his game,” says Chris. “We work with him to bring our spirits to life through ambitious, delicious cocktails; exciting drinks that celebrate and showcase them – not overpower them. 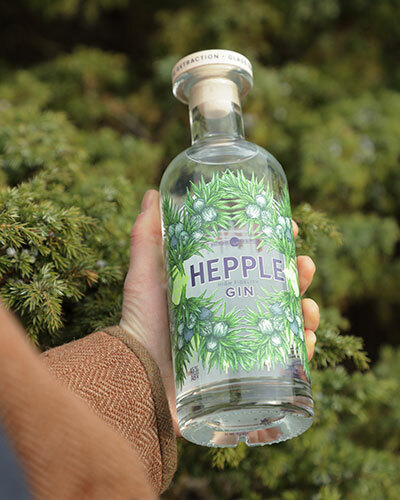 “There’s a real cocktail renaissance going on at the moment and people seem to be only falling deeper and deeper in love with gin, so it’s important that Hepple stands out and shouts in the bars and restaurants. “The North East’s food and drink scene has really leapfrogged in terms of quality over the last few years,” adds Chris. Before our time at Hepple HQ comes to an end we head back out on the moors one last time to get some shots of the guys’ beautiful bottles. “Hurry back when you’re done,” shouts Chris, poking his head out of the distillery doors. “We’ll have some gin and vodka waiting for you. It’s five o’clock somewhere, right?” I like these wild spirits a lot. I know you will too.